I would have totally forgotten the Eight Ways to do Irimi Nage from kata dori that Bill Witt Shihan showed in the early class of the Memorial day Gashuku today if not for Barry and Kara, who helped me piece them together on the back of an envelope at lunch break. A few of these I'd never seen before, especially a fancy one that triggers when the standard way of doing ikkyo from kata dori breaks down. Instead of trying to force the arm down you give way and instead drive the inside hip through, turn 180 degrees and strike straight down. Uke's body just folds and you can step behind for Irimi Nage giving uke a big surprise. Dennis Tatoian Sensei walked out onto the mat for the first afternoon class looking more menacing than usual. That was because he was wearing an eyepatch due to an infection. he looked like Long John Silver. Tatoian Sensei was on his game today. 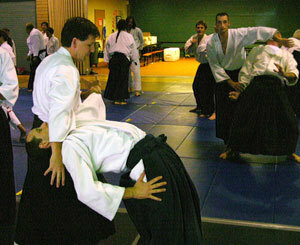 He always emphasizes Kokyu Ho techniques because, as Saito Sensei said, all aikido is based on kokyu ho, and because not many other teachers point out the distinction between kokyu ho and regular kokyu nage. Today he said, "I'm going to show a number of kokyu ho techniques, and we'll explore the martial applications of these." Right there I knew it would be a great class. The above shot shows Dan trying out a nasty one on Scott. In the background you can see Julian and Jor. I've written about kokyu ho as a kokyu engine. Tai No Henko, Morote Dori Kokyu Ho and Suwari kokyu Ho are all kokyu engines, and practicing them will make your Aikido powerful. Saito Sensei, and his student Tatoian Sensei always would practice these three techniques during each class. The picture above shows Lars Andersson Sensei delivering an atemi during practice of one of Tatoian Sensei's more wicked "applications." Tatoian Sensei stopped us at one point and yelled, "Dame Dame Dame!" Then he explained how when Saito Sensei would yell Dame at you it was really a compliment. he had thought enough of you to actually watch you and offer correction. Tatoian Sensei spent some time reeling our minds back into our bodies. "Watch what you are doing," he said. Cautioning us to avoid just going through motions, he said, "set yourself and offer your hand (for tai no henko)." To uke's he said, "set yourself and when the hand is offered then grab, don't just reach for it out of habit." This instruction had the effect of making us all present, more or less. Once he had our attention, Tatoian Sensei advised everyone to try video taping their Aikido. you might not like what you see, he intimated, but you will see what it is you're doing, for better or worse. I remembered how he would always tape our after-class sessions. He said, "when I left Iwama Saito Sensei said, 'you are going with two teachers. The first is this bokken; the bokken will answer all your questions. The second teacher is Kagami Sensei; the mirror. Watch what you are doing and you will learn'." After class Barry and I remarked that it was the best class we'd ever seen Tatoian Sensei give. Barry has been his student for over 10 years and he said he'd never seen him better. 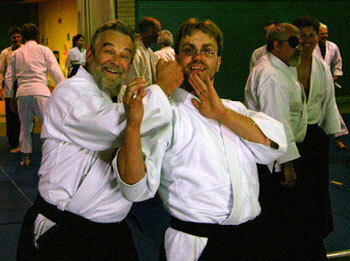 Goto Sensei followed after a short break, continuing the kokyu ho theme. He said that Aikido has three components: Tai Sabaki, Kokyu Rokyu, and Ki Musubi. Tai Sabaki is body position which includes footwork and hips. For a while he has us just focus on body position, hanmi, and spacing. This uncovered a multitude of evils, and we worked hard to correct sloppy footwork and body position relative to our uke. Next we explored kokyu rokyu and ki musubi in turn within the context of three different categories of training: Kihon, or static; Yawarakai, or flexible, and Ki No Nagare, or flowing ki. It was a challenge in yawarakai to begin moving precisely as uke lands a grab. Flowing practice is a challenge simply because you have to do the Tai Sabaki, Kokyu Rokyu, and Ki Musubi thing all on the fly. Goto gave us a lot to process, but he'd packaged it in an effectively organized presentation, and I think the distinctions will stick. After class everyone was busy folding hakama, getting directions to tonight's parties, buying T-shirts, and downing advil. Tomorrow is all weapons. Stay tuned. I can't disagree that Segals peaonsrl life has become a joke but if you watched that entire video and just watched for negative things to post about then I feel bad for you. In that small clip if you couldn't see there were things Anderson could pick up then you really know nothing about martial arts or MMA in general. Every martial art has something to offer, even a passive style like Aikido. I train Jui-Jitsu and kick boxing myself but Ill say this, Id take an Aikido guy against say a knife wielding mugger over any mma trained fighter. Just because a martial art does not translate as well in to MMA does not make it any less effective. Lets not forget MMA is pretty far from a real fight.